Nice photo, love his hands. This little scarf is very fashionable. The suit of denim makes for quite the catch. He’s a very stylish man and his face expression seems like he’s clueless about something. I have interesting fashion posts you might love to read. Variations of Blue, and still drawn to the neckerchief in Blue. The neckwear jazzes-up the all-denim ensemble; being in tune with the colorway makes it work. What a cutie. Love it when guys wear little scarves! This is a great look. Love the button up. I love the hand-knit hat. Yet if I were to make one like that with the little chains in it, I’m not sure that any of the men in my life would wear it. They might find it too girly. But maybe they’d surprise me! I don’t like beards, blonds or denim, however this guy looks “hot”. So you can put together a lot of elements that people don’t like and create a great look. I think its called “personal style”. Of course the photographer is not bad either. We are seeing more and more of a fuller pant in recent months, which I must say looks fantastic to my eyes. mmmm, I see this look every day in Edinburgh . . .
love his bear and hat! simplicity but very stylish indeed,and the scarf matches the hat, Yes! Love that he can rock the denim on denim. Takes some very clever styling. Love the homemade hat. Looks great! Love everything but the scarf. Looks like a napkin. it’s like what cary grant would do only wihout that hat. i saw once he did pull off all denim outfit within white shirting pinned cufflinks. gentlemen always know how to stick with thier good pairs of accessories. no big woop but just that we are with the same loop and that’s comfortable. I love this cowboy look, but prefer 501′s or 505′s. With a crotch that low you could only get your leg over a miniature pony, (in the strictly cowboy sense of that phrase). Great face and interesting style. I’m loving everything about this picture. A knit cap and denim jacket can go a long way! I love the total look…the scarf gives a chic touch , isn’t it? love your work! when are u coming to Brazil to take pics?? well dressed and nice look. Interesting with the jumper and the jeans jacket. 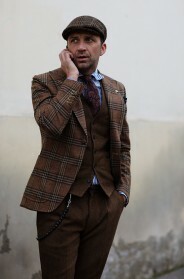 You have been luck for pitti uomo, the weather was warm and nice. Now it is -3 °C!!! i really like his look! The denim scarf + jacket combo is gorge! Great style! He seems so cool!I love his shirt and the scarf!! He looks like a backpacker. Nice look, but the neckerchief ruins it (a neckerchief ALWAYS ruins it). Too fey. All is simplicity and the denim neckerchief is… so cute ! I do not like his scarf, like he tows it, it looks pretty much like table napkin. Love a man with a good beard! [gasp!] is that a to-go cappuccino? I am afraid I cannot sanction the “denim suit”. The only ones who should wear that much denim are cowboys and East Bloc laborers. 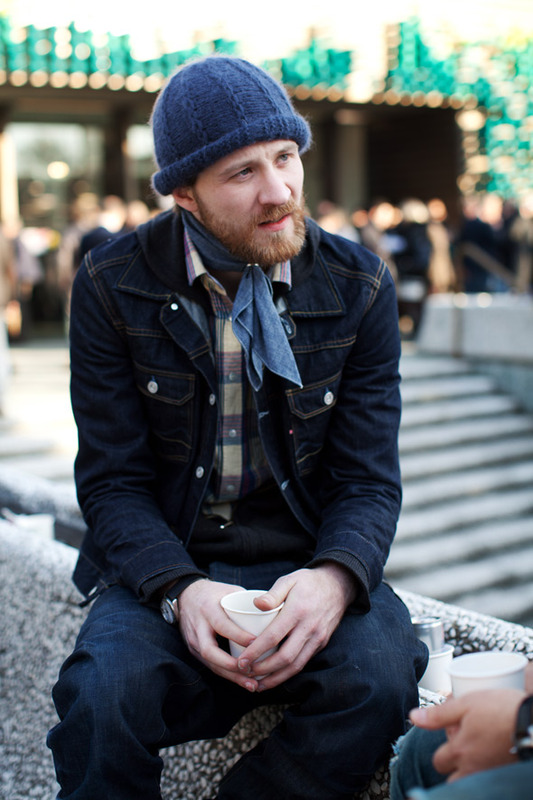 I like that the knit hat (it does look hand-made) softens the whole denim look and makes it a little more androgynous. reminds me of the recent ?French photo with the man in quilted Chanel scarf. his grooming (hair and beard) also softened his look in a similar way. Handsome ! Very chic and fashionable . I love yez ! LOVE the whole denim look and most importantly the cute blue hat ! Looks like the nice Big E Denim Jacket and RAW JEANS. check BIG E out you will love it. I really like the deep blue of his jeans items… he really did a nice job! For me his look is all about what’s in his eyes the intelligence and intensity. He is rocking that doudle denim! I love how effortless his look his. Neck tie too prominent for me. Oh he looks so cool! I simply love it. I’ve always had a weakness for all denim/check combos and he certainly does it well. This is simply amazing! This caught out eye! Un’espresso a la fortezza! LIKE!!!! Love that he can rock the denim on denim brand fashionable jeans. Takes some very clever styling. His eyes look sincere as he chats. That’s the most attractive point about him. I wish he was standing so we could see the cut of the trousers; there looks to be a lot of fabric there, like a 1940s or 1950s style.